Unique in its direct and comprehensive approach, this Fourth Edition presents a working knowledge of biomechanical principles for use in the evaluation and treatment of musculoskeletal dysfunction. Three sections address the biomechanics of musculoskeletal tissues and structures, the biomechanics of all human joints, and applied biomechanics. 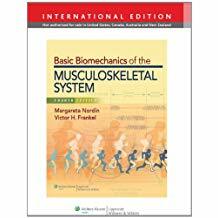 The book features contributions from a variety of disciplines including orthopaedic surgery, physical therapy, occupational therapy, hand surgery, physical medicine and rehabilitation, sports medicine, biomechanical engineering and anesthesiology.This edition's new introductory chapter explains the importance of biomechanics study and includes the "International System of Units" appendix. A new section on "Applied Biomechanics" includes chapters on fracture fixation; arthroplasty; standing, sitting, and lying; and gait. Boxes with biomechanical computations promote comprehension of biomechanical principles. Practical examples and clinical case studies apply biomechanical knowledge to practice. Additional illustrations, including radiological images, enhance comprehension. A Brandon-Hill recommended title.